Groupon chief executive and co-founder Andrew Mason has been fired and says his biggest "regret" was the times he did not "have the courage to start with the customer". Mason was ousted a day after the company's value plunged around 24% after disappointing results for the year ending 31 December, which saw it post an operating loss of $12.9m in the fourth quarter. The site has seen its stock price take a hammering since its IPO in November 2011 amid growing speculation the daily deals model has fallen out of favour with the public. Rival site LivingSocial told 400 staff in November to, which accounts for around 10% of its workforce, that it was laying them off and posted a loss of $650m in 2012. Mason told Groupon staff that he had been fired in a memo that began: "I've decided that I'd like to spend more time with my family. Just kidding - I was fired today." In the candid memo, Mason admitted he was "accountable" for the "controversial metrics" used by the company and the fact the stock price is "hovering around one quarter of our listing price". 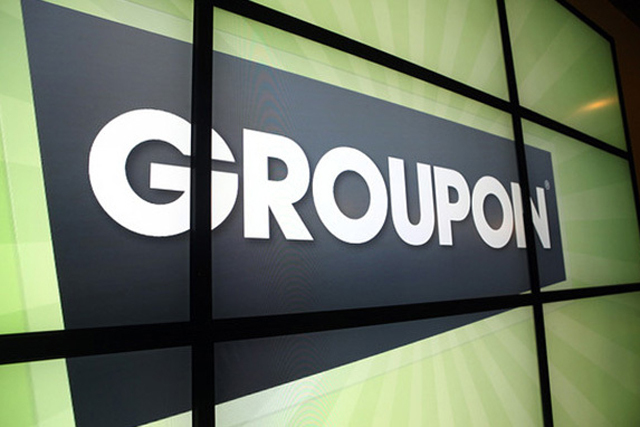 Groupon has announced executive chairman Eric Lefkofsky and vice chairman Ted Leonsis have been jointly appointed to the newly created office of the chief executive on an interim basis. Lefkofsky credited Mason for his role in inventing the daily deals space and praised his "leadership, his creativity and his deep loyalty to Groupon". After initial early success, Groupon has begun to struggle as competition in the market increases as Google and Amazon enter the fray and growth within the popularity of digital couponing slows. Research from eMarketer estimates 92.5 million in the US redeemed a digital coupon in 2012, up 4.9% from 88.2 million people in 2011. However, eMarketer predicts the market will only see 4.6% growth in 2013 and 3.4% growth in 2014. Groupon has also particularly struggled in the UK market with Roy Blanga, managing director for Groupon UK, admitting to Marketing that "we haven't been as good as we should have been". Matters came to a head when the OFT launched an investigation into the company in July 2011, while in December 2011, the Advertising Standards Authority (ASA) referred Groupon to the OFT over "serious concerns" after it broke UK advertising regulations almost 50 times in less than a year.